Fiona Suthers is the co-ordinator for our Pony Club tests and Achievement badges. 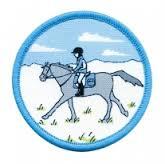 We offer the full range of Pony Club tests from E to B (and above if required) and a wide variety of Achievement badges. Training takes place at Plum Park Farm and involves both mounted and dismounted sessions. Please contact Fiona (Fiona.suthers@btopenworld.com) for further information. To be taken at E to D Level. It must be passed before the D test can be awarded. This can be taken at D+ to C Level. It must be passed before the C test and involves a minimum of 5 hours training. This is to be taken at C+ to B level. It must be passed before taking the B test. All the badges are run over 3 x 1.5 hour sessions.